You must make reservations at least 5 minutes in advance of the time at The Seafare of Williamsburg. A 2012 DiRoNa award winner featuring three unique dining rooms. 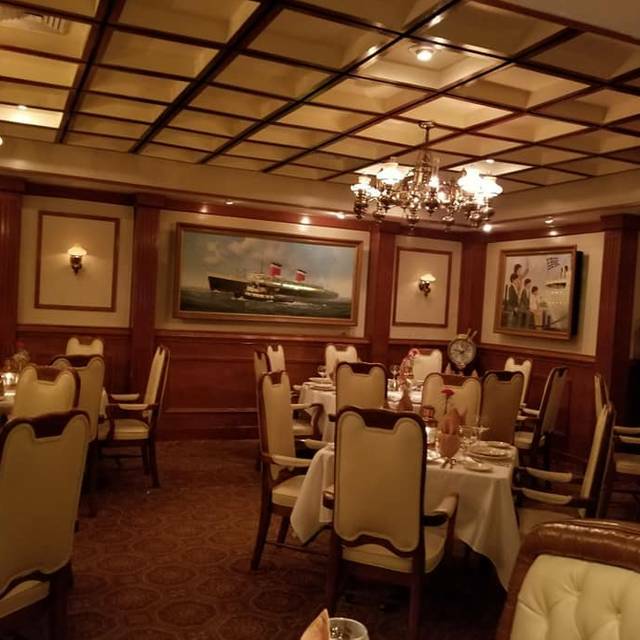 The Seafare of Williamsburg introduces a 91-item menu that features fresh seafood, certified prime beef and tender veal. Our speciality is sauton ceramic cooking where seafood is simmered in its own juices and blended with ingredients. Baked in Natural Seafood Juices and Blended with Wine, Golden vegetron, Pimento, and mushrooms in ceramic dishes. We arrived in the pouring rain on a very busy Friday. We were ushered into a room covered in cool paintings of ships that showed light in the windows/portholes that was quite cool. Our server greeted us, and we ordered both soups and our entrees. The crab bisque had the consistency of creamy grits, but without any taste of crab (or much of anything). The clam chowder had the same consistency, but with potatoes. The flavor was a little better, but we couldn't detect any clams - pieces or whole - in the soup. We were very thirsty, but had to refill our water ourselves. Many people walked by/around our table, but no one noticed our water glasses were empty. Don't worry, though, those that paid for alcohol were treated much better on their refills (at other tables). We had a very neat palate cleanser of orange sherbert (normally this is a light sorbet - lime or lemon) but the tradition was kind of neat to see still around somewhere. During our meal, the lights kept dimming and brightening and also turning off. The on/off lights appeared to be from the weather, but the man who seated us kept dimming and brightening the lights. Maybe next time he can be restrained from whatever causes him to need to change the lighting while people are eating. Finally our food arrived. While containing a small amount of filler, the crab cakes were huge and chunky. They were gorgeous and quite tasty. My husband's fried seafood platter was very tasty. My friend's crab cakes were good. My veal oscar was small, overcooked, with a miniscule amount of sauce but tasted fine. The potatoes were so creamy they looked almost instant (but tasted ok). The veggies were steamed and tasted pre-frozen (and very very bland). All in all, we felt like a second thought to the staff, and didn't receive much attention. We paid $150 for the privilege (including tip). Never again. If I'm going to throw down that kind of money, I'll go somewhere the food is consistent with better service. Sadly the food was bland and there was a screaming toddler the entire time we were there. I even called the restaurant from my table asking them if there was anything they could do to get the child to be quiet for the rest of us. 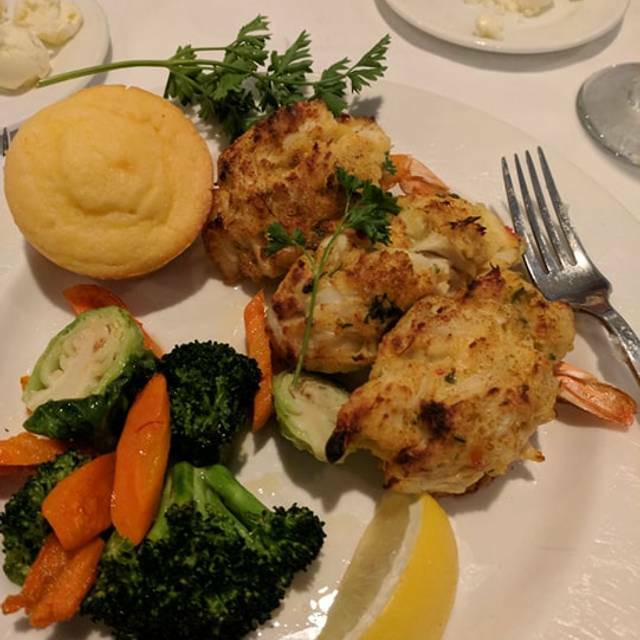 We ordered clam chowder which had very little clams and was basically potato soup, my husband’s seafood melody was very very bland and tasteless; my crab stuffed shrimp was cold and doughie. We spent $125 and very disappointed. Will not go back. Every visit to Wiiliamsburg includes dinner at the Seafare. The atmosphere, caliber of food and courtesy of all staff is still as outstanding as it has been for years. Simply put-------------this restaurant is a treat. This restaurant is outdated. It seems they are trying to keep up traditions that may have been new or special over 40 or more years ago. An example is being offered a small scoop of “sorbet “ that was in truth just plain cheap sherbet. I guess the idea was to “cleanse the palet” but who does that anymore? Definitely not modern farm to fork fresh food restaurants. The food was ok but not worth the price. The decor is outdated, the service was fine but the whole experience was kind of weird from the small frosted sweet piece of bread given at the beginning of the meal to the corn muffin offered later. Rather than just putting a basket of bread on the table the waiter held out a basket containing two rolls and had my husband & I take one out of the basket. With all the other great restaurants in Williamsburg I’m not sure why anyone would want to continue going here. Service staff did not know how to serve wine. They could not open wine. They did not listen when we said we would pour for ourselves because theonly wine by glass was Mondavi which is horrible, so we purchased a bottle of a good wine to share but did not want to drink it all as we were driving. But staff kept coming over and trying to pour and refill our glasses. Had to repeat ourselves several times. Service staff hard to understand and hear. Trout my friend ordered was filled with bones, every bite and some were very big. A chef should remove most and you should only find a few if cooked correctly. Mashed potatoes tasted instant. Dessert menu very limited and redundant. Would not recommend. This place seemed very dated. Service was very slow. It took about 5-8 mins for a server to acknowledge us. Food was just average nothing to even to write about. Will we return probably not. Food was average at best. Building was dated and menu was very expensive. The server was the best part of the meal, very attentive and good at his job. It is a bit pricey, so we don’t go often. But for a special occasion it is a wonderful restaurant. The food and service are outstanding. It makes for an very enjoyable evening and a very nice dining experience. Thank you for being in out town for so very long! The bread that comes out tasted like it has sweet icing on it.very unusual. My butter for my potato tasted like a mixture of sour cream and butter. Very odd. Wanted only butter. 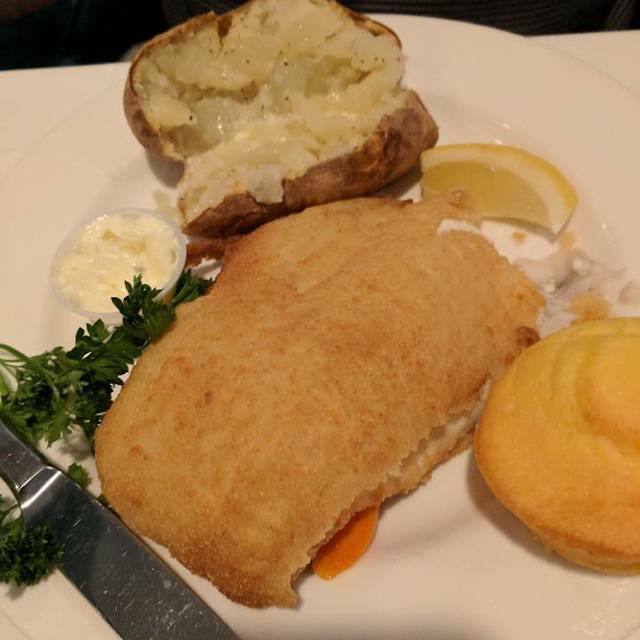 My fish would have been ok but there was so,much sauce it was mushy.service was good.I was not impressed with food for the money.on the expensive side.$ 48.00 for one person with tip. I did get strawberry shortcake but was very dry. Fantastic experience. Some of the best seafood you will find in Williamsburg. Seafare is our favorite restaurant in Williamsburg. We always celebrate our Wedding Anniversary there. 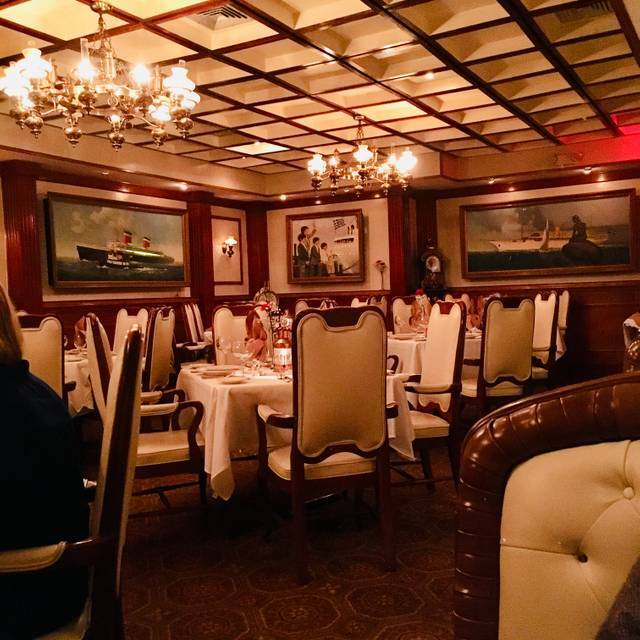 The service is impeccable, the food is always outstanding and the ambience is great. The food was just okay and not a lot of flavor at all. Very expensive for being disappointed in the quality of food. The person who created us at the door was very polite. I have no problem paying for a very good meal so cost was not the reason for not rating the restaurant any higher. Oysters on the half shell for appetizer followed by two main dishes Stuffed Flounder and Baked Potato. We drank tea for dinner. Oysters were very very small came with only cocktail sauce. Had to ask for hot sauce and horseradish. Drink was tea. Never got asked if we wanted a refill although glasses sat empty for the better second half of dinner. Our waitress seemed to have had a rough day not very friendly but sometimes we all have a bad day and it reflects in our demeanor at work. 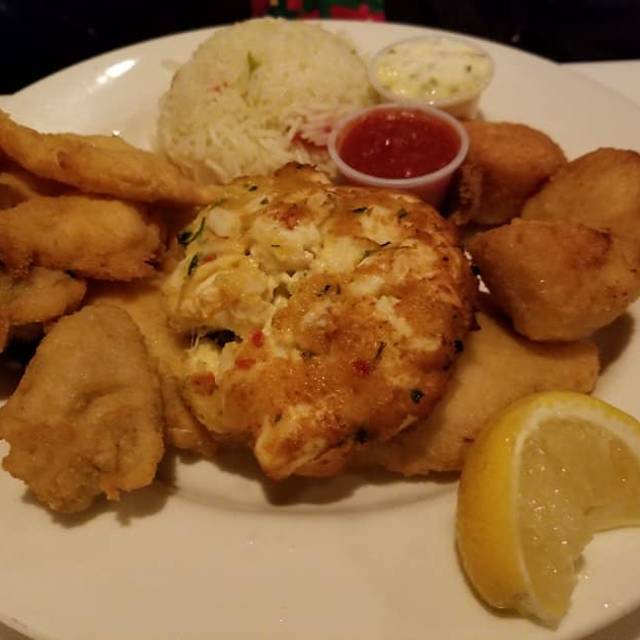 The stuffed flounder was bland and the crabmeat stuffing was more of a white sauce base, very little crabmeat. 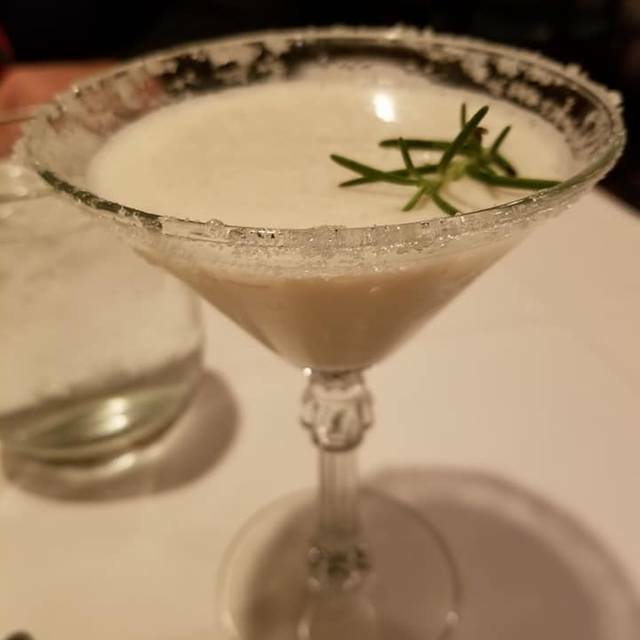 We were offered no other garnishes for our potato except butter. 105.00 dollars for 12 oysters, 2 flounder dinners and 2 ice teas. I only left a 15% tip because our waitress was not very helpful. Overall food was mediocre and overpriced. My date noticed light covers missing from the chandeliers. For what we received very overpriced. Seafare is a restaurant with charm. Kind of an old school feel about the place. The service was great and everyone was very friendly. The food was below what was expected. The red snapper was overcooked and prepared without much excitement. Was looking for a "wow" dining experience . Seafare did not deliver. We went on a recommendation. It was a birthday and the whole experience was perfect. My mom, the birthday girl, had a great time. The food was wonderful and the service was terrific. Ordered the veal and lobster for two and I was shocked to see that we both received about two bites of lobster each and the veal was sitting in a layer of grease, this will be my last visit here...total bill with tip over a hundred dollars and we didn't have any alcohol...really! Our server, Anna from Ukraine, was outstanding. She helped make the evening an even better experuence. Inside is NOT a fine dining environment. Looks cheap. Outdated. Weird ship cabin feel. Free bread was cold. Swordfish covered in way over cooked veggies. The rest was terrible, boring flavors, overcooked shrimp and lobster, drowning in oils. Server added $6 to my credit card charge after I got home. I guess $15 tip on crappy service and terrible food totalling $85, just wasn't enough for him. The owners are first class and the food and atmosphere is excellent. Absolutely delicious and fresh Seafood! Only complaint would be that we prefer our salad to be cold. We always come here for special occasions and it never disappoints. Seafare is one of the best restaurants in Williamsburg for Seafood. Some items lacked seasoning, or sauce that was supposed to be used. It's what real dining is supposed to be. Great amenable service and food. Perfect restaurant for quiet conversation. You won't have to scream here! Awesome, as usual. This was about the 20th time I've eaten here over the years, and it never disappoints. Went during Restaurant Week on a Sunday night. It was vert slow, so we had the place to our group of 6. Food was excellent. Service also excellent. They have a very nice wine list with varied prices, domestic and foreign. We ordered anything off of the menu, and the entrée price included a salad plus desert. Would definitely go again. 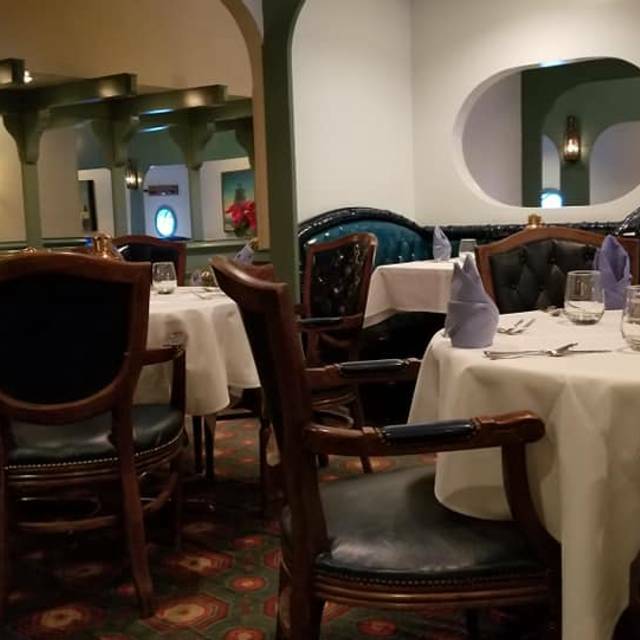 If you are in the mood for some old fashioned, white tablecloth, attentive service with the trappings of multiple courses, then this place may be a great find for you! It sure makes the evening feel a bit extra special. Lots of places still offer fresh ground pepper on your salad, but here you will be treated to other details like a small sorbet to cleanse your pallet after the salad. Three offerings of baked carbs at appropriate points in the meal: somethings small and sweet with the menu, traditional bread and butter, and corn muffins on this occasion. The meal itself was a solid B+. My blackened swordfish was good but could have been "more blackened" (but hey, this is Virginia), fried flounder was very lightly breaded, our table-mate raved about his salmon - which I noted had a light touch of seasoning. They are willing to let the fish speak for itself. If you have room for desert, three offerings are prepared at the table - another showy delight. Coffee was fresh and smelled great. Our relaxed place meal took about 90 minutes. What not to expect? If you need pristine carpeting and shinny, modern restrooms this facility won't impress you. Everything was clean, but the building is aging. I have been looking forward to dining here for a few years and was not disappointed! The hostess helped me plan a surprise birthday dinner by placing the flowers at our table prior to our arrival, putting them in a vase and making sure the guest of honor was comfortable. The service was impeccable and their wine and menu was outstanding! I have been raving about it and we are already planning a return visit! Server was attentive but he couldn’t make up with my disappointment with the food this visit. We usually stop in once a year for my favorite crab cakes while visiting VA . When I took the first bite of crab cake, I said they’re not the same😞. First of all they were smaller and worse of all they were at least 1/3 filler, which I separated from the lesser quality lump crabmeat. What happened to my favorite big lump crab cakes with just enough filler to hold it together? Had been craving those crab cakes for weeks but left restaurant quite disappointed. My husband usually orders the shrimp scampi. Although he said the flavor was very good, the shrimp were half the usual size( but not the price). Guess I’ll have to look for another crab cake restaurant. This restaurant has been in Williamsburg for decades, serving the best crabcakes and fried shrimp I've ever had ! The service is close to that of a cruiseline, with white linen tablecloths and constant attention. Anna is the best server ! Give it a try, you'll like it! We had a nice meal at The Seafare. The decor seemed a little dated, but it was quiet and a great place for our anniversary. I am not a seafood person, so I had the small strip steak. My wife had the stuffed shrimp. Hers was very good, mine was OK, but I've had better. The meat was prepared correctly and had good flavor, but I though it was kind of tough. The drinks were great and they kept a nice variety of breads coming! Our waiter was outstanding, very friendly and when we mentioned that it was our anniversary, he showed up with coffee and a huge slice of amazing chocolate cake with a candle and coffee (on the house). Very classy! And on that basis we would go back. Great restaurant. Love taking my wife there for romantic a dinner. It is a tired old place that was practically empty on a Friday night of a holiday weekend, not a good sign. Sat at a table for ten minutes, with no drink order, we decided not to risk it. Host and server saw us leave, nobody asked us if anything was wrong. Must be a normal occurrence. 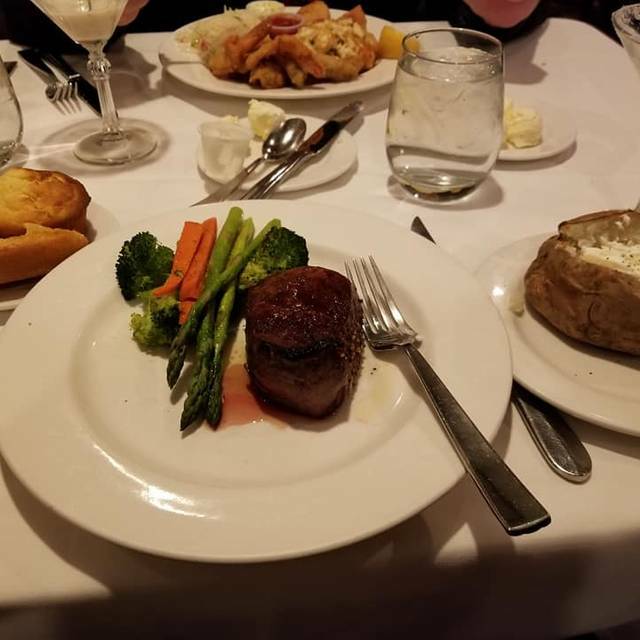 Always top-notch food and service! The seafood Sautin is the best. Great food and service. This restaurant pays attention to all of the important details to give you a wonderful experience from start to finish. Wonderful experience. Took some friends there after Christmas we had a wonderful time. Food was great, portion large, no room for dessert.